As you all ready know Snapshot Serengeti’s thousands of camera-trap images are part of an ongoing study into predator interactions by Ali. There are few projects that use camera-traps as extensively as Snapshot Serengeti and of course Ali has her hands full analysing the bits relevant to her. The cameras work around the clock recording details of daily and nightly life in the Serengeti and do not discern between the stuff Ali does and doesn’t want. That’s why, Ali’s sanity aside, they are such perfect tools. Those same cameras providing Ali’s data could also be the basis of a future ecologist’s research. One of the most striking asides for me is the case of the giraffe and the oxpeckers. Oxpeckers are small birds that feed on ticks and other parasites that they glean from the bodies of large mammals. Most usually they are seen riding along on large mammals such as buffalo, wildebeest and giraffe whilst they search their hosts for ticks or open wounds. This in itself is not an unusual occurrence and most of you will have hit the bird /other button with these guys. Much more unusual are the shots of giraffe at night time with these birds using them as roosting spots. There are two species of oxpecker, the red-billed (Buphagus erythrorhynchus) and the yellow-billed (Buphagus africanus) both of which are found in the Serengeti. According to research carried out by M. Stutterheim and K. Panagis that looked at the roosting habits of both species the red-billed oxpecker roosts in trees but the yellow-billed was often found roosting on their preferred host species. Apparently red-billed oxpeckers feed on a wide range of host species where as yellow-billed oxpeckers are much more picky preferring buffalo and giraffe. It is thought that the habit of roosting at night on their favourite host species is an adaptation to save the birds time looking for the right animal the following day. Given that buffalo and giraffe are prone to walking large distances this is probably very sensible. From most of the images we have of oxpeckers on giraffe at night it is hard to tell which species they are but there are one or two where you can see the tell-tell yellow bill confirming that they are indeed yellow-billed oxpeckers. 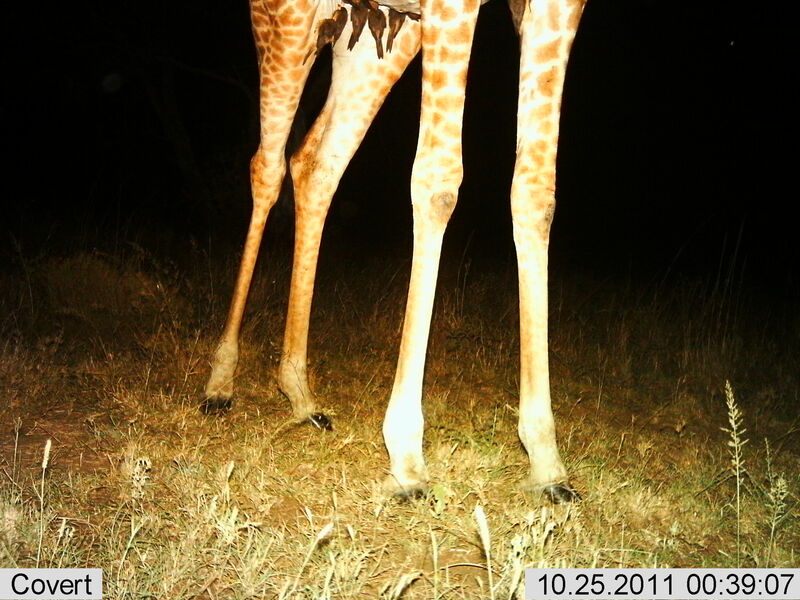 The images also show that the birds seem to prefer settling between the hind legs of the giraffe. This must be a nice warm spot in winter and keeps them safe from any nocturnal predators. Perhaps the behaviour is not so unusual after all but rather little documented. Getting photographic evidence of birds at night on mobile roosts is obviously not easy. Looks like our camera-traps have excelled themselves again. Do you want a photo of three cheetah brothers hanging out by one of your Camera Traps in Serengeti? Really cool shot, Jim! Thanks for sharing. Is there truth to this? I was told that in picking bugs off of their hosts oxpeckers can leave a small wound that can then be infected by flies who lay eggs that hatch. This provides an ongoing source of food for the birds. I think the jury is still out on exactly whether the oxpeckers are beneficial cohabitants or pests. It may vary from species to species; apparently some species won’t tolerate the presence of oxpeckers whereas others will.